Tiny Ruins Share Video for New Single "Holograms"
New Zealand band Tiny Ruins have shared the fourth single from their forthcoming album Olympic Girls, out Feb. 1 on Ba Da Bing. It’s called “Holograms” and arrives with a beautiful new video, which you can watch below. “Holograms” follows previously released singles “School of Design,” “Olympic Girls” and “How Much.” Tiny Ruins, which originated as frontwoman Hollie Fullbrook’s solo songwriting project, has always been a nesting place for spare, delicate melodies and verses full of natural imagery and big ideas. 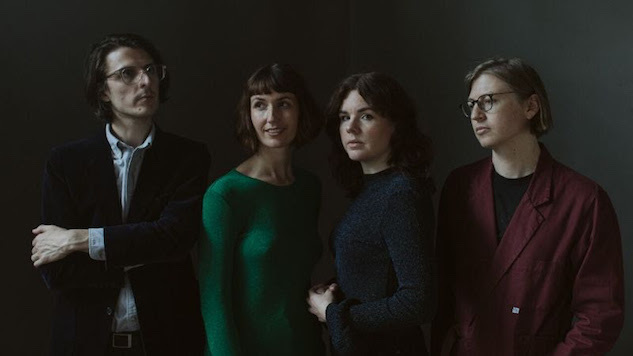 But there’s nothing delicate about this latest batch of singles: “Olympic Girls” is warm, full and unexpected—a lively flute finds a home next to electric guitar; Fullbrook’s smooth alto sighs along with clashing cymbals. “Holograms” is just as beautiful, and it’s one of Fullbrook’s biggest ideas yet. Remember when rumors circulated that Prince’s hologram would appear during Justin Timberlake’s 2018 Super Bowl halftime show? The news sparked controversy about the ethics behind using holograms to, essentially, reincarnate an artist who’s passed. Instead, Prince’s image was projected on a sheet during Timberlake’s spectacle, but many were still pondering the question of whether holograms cross the line. Fullbrook seems to have this question on her mind, too. For the video, I wanted a sense of longing for this sparkly, colorful other realm, where everyone is connected, in unity. The director Martin Sagadin and I both started out talking about how the song called for a sense of sci-fi, which led us to planets, which led to the idea that we would build planets out of lanterns. This storyline arose where my character is trying to communicate or reach out to another field of existence, via technology. But we felt that the technology could be a bit old and not quite “of this time”—we were inspired by Kate Bush’s “Cloudbusting” video, or the TV series Maniac, in the sense that technology is kind of old and defunct, and there’s a timelessness or lack of specificity as to time. The idea of the video, is that I have a vision of this place I am trying to reach … I gather up particular objects that I feel will connect me to this place. But in the end, it’s futile—I try to reach the planet that appears through the wall, with all my technology revved up, and … it collapses in front of me. Olympic Girls is the follow-up to 2016’s Hurtling Through. Again, you can watch the video for “Holograms” below. Further down, listen to Tiny Ruins’ 2014 Daytrotter Session. Preorder Olympic Girls here.